Our tour to Paris in June is well timed for the gardens. We combine some fascinating gardens of châteaux in the surrounding countryside with others in town, adding elements of the influence of modern designers such as Patrick Blanc – renowned for his vertical garden – and Gilles Clément’s prairie style designs. Roses will be a feature and the profuse displays at Jardins de Bagatelle are exuberant. 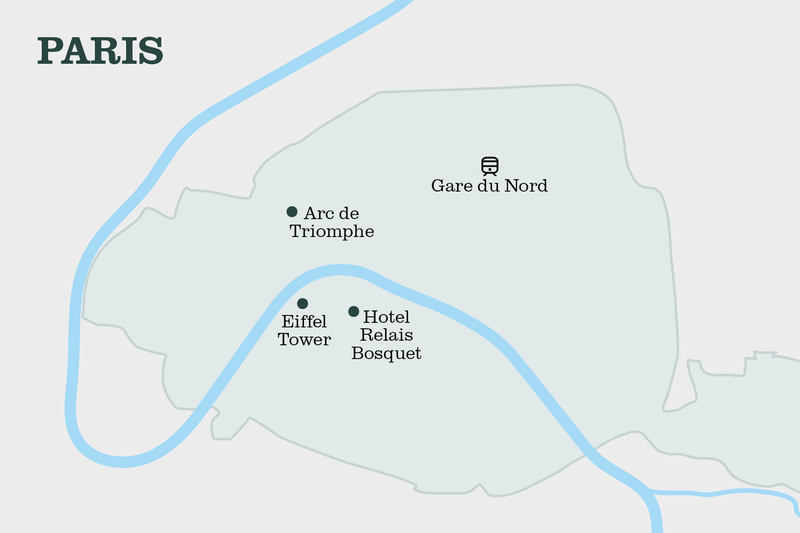 We stay in a charming, small hotel in the 7ème district near the Eiffel Tower and the river Seine. We enjoy dinner on the rooftop restaurant of the Musée du Quai de Branly – and hopefully the sunset will be perfect. Travelling by Eurostar from St Pancras is a relaxed way to arrive in Paris; we use a minibus for all our visits and transfers. Early morning departure from St Pancras on Eurostar direct to Paris Gare du Nord. in the 7ème district. Afternoon visit to Jardin des Plantes to discover the rich collection of plants gathered together in this botanic garden. Return to the hotel. We enjoy an aperitif together and a short introductory talk. Evening at leisure. Driving southeast out of Paris to Courances, we arrive at a majestic entrance of plane trees leading to the seventeenth century moated château. Its water gardens are spectacular; they were re-created more recently by Achille Duchêne. We enjoy a guided visit of the extensive park and gardens. Lunch is served in a restaurant in the nearby attractive village of Barbizon. Return to Paris in the afternoon with some free time before we meet for dinner together in a nearby restaurant. The extensive Jardins de Bagatelle in the Bois de Boulogne was created in 1775. The rose gardens are legendary, and we discover magnificent trees and superb planting in a delightful setting. Lunch in the garden restaurant. In the afternoon we take a bateau mouche along the River Seine to admire the impressive architecture bordering the river. Evening at leisure. Our visit is to St Jean de Beauregard, a beautiful château south west of Paris. The owners have recently restored the extensive walled kitchen garden in the eighteenth century style, incorporating vegetables, fruit and flowers in a beautiful decorative display. We enjoy lunch in the grounds, returning to Paris in the afternoon. Evening at leisure. property in the country designed in the Age of Enlightenment. Our guided tour reveals a summerhouse designed to resemble a shattered column, a pyramid that is actually an icehouse and a Chinese pavilion. We return to the hotel and enjoy a delicious dinner in a roof top restaurant with views to the Eiffel Tower and the River Seine. A relaxed morning with a chance to visit the nearby vibrant food market, or taste macarons with coffee, before the transfer to the Gare du Nord for the return Eurostar journey to London St Pancras. Travel by Eurostar and transport in modern comfortable minibus. Accommodation with ensuite bathroom, delicious meals as indicated, all garden visits and guides. Alcoholic and soft drinks (except the aperitif on the first evening and the final evening’s wine), items of a personal nature, comprehensive travel insurance with full cover to be taken out on payment of the deposit. The climate in June will be warm and summery but with a possibility of showers. Layered clothing is recommended, with a waterproof jacket in case of a shower, and good shoes. Smart casual for the evening. Meals included are shown as B (breakfast), L (lunch) and D (dinner). Wifi is available in the hotel. Good walking ability for a minimum of two hours visiting gardens.